Elderberries are delicious! So is Elderberry Mead. Even more than just being tasty, elderberries are useful and quite a potent medicine. I make jars full of elderberry tincture and cordial all throughout the year to stock up for fall and winter coughs, colds and flu. Make your own batch of delicious, healthful elderberry mead! I love it when tasty and healthy go together so well…especially in something like home-made booze! Now, I don’t encourage you to over-drink if you are feeling ill, but alcohol has its own beneficial purposes when used sparingly. Elderberry mead is a great drink of choice for when you feel yourself coming down with a cold and need to get some rest – try it mulled (warmed with spices like cinnamon, clove, etc.) for a bedtime drink. This particular batch was started on January 20, 2014, bottled on April 20, 2014, and the first bottle was opened on August 9, 2014! It didn’t last long. Grab a large stockpot and add about 2/3 of a gallon of water to the pot. Add the diced ginger and allow it to come to a boil. While the water heats, sanitize your gallon carboy, airlocks, bungs, and funnel with a store-bought sanitizer, or try a bleach and water mix. Make sure you rinse it well afterwards if you use bleach! When the water is at a steady, rolling boil, throw in the dried lime, raisins, and the handful of dried elderberries. Cover the pot, turn off the stove and remove the stockpot from heat. Let it wait for about 15 minutes, and then add the honey and stir well to dissolve. Let it cool down for a bit, and then set the funnel in the neck of the carboy and pour in everything – the hot honey water (also known as must), ginger, and berries. Pour in the rest of the gallon of water until the must is up to the neck of the carboy. Add in the bung and the airlock to keep everything clean. Allow the must to cool down to body temperature before you pitch your yeast – this can take a few hours so I sometimes just leave it overnight. In the morning you can pitch your yeast into the jug. Since it is a gallon batch, you can add only a half of a packet of yeast and re-cap with the airlock. By late March, the jug had cleared and the mead looked to be mostly ready. I took the airlock out and used a sanitized straw to taste a bit of the mead. It needed more sweetening, so I made a sugar syrup and added it to a clean, sanitized carboy, leaving behind the ginger chunks and elderberries for the compost bin. I racked the mead onto the sugar syrup and let it sit again for a few weeks to ensure that fermentation was completed. On April 20, I bottled the mead (in beer bottles with beer caps!) and let it rest until August. Ok! So the results are in. This is a nice, light mead that turned out a bit dry. The berry flavor is light but definitely present, and stronger if I add additional sugar syrup to my glass. Even though I waited to bottle it until the fermentation seemed to be complete, there are some bubbles in this batch. That tells me that there is residual yeast that continued to grow after bottling. Next time, I’m going to let it ferment longer in the jug so it isn’t fizzy in the bottles, that’s for sure! Add Camden tablets before you back sweeten the mead. It will kill the yeast and stop your secondary fermentation. Thanks for the tip, Ted! I know many brewers who use those with great results, but I have a sulfite sensitivity and prefer to brew without using campden tablets. Was wondering how long a time period from start to first drinking. This elderberry. Mead sounds so good, maybe with desserts. I was wondering if you can use fresh instead of dried elderberries? Hi, I make muscadine wine using of the shelf bread yeast. 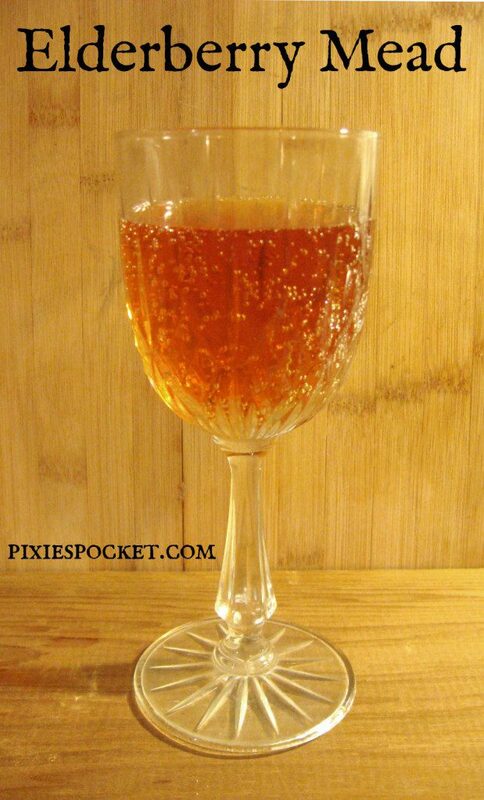 Have you tried to make your mead or wines using bread yeast? I have people tell me that the wine is very good and ask for more. I double the sugar so it is a sweet wine. This year I added elderberries to the mix and it also turned out well. My process is a little different too. I don’t place the ingredients directly into the carboy. I start everything in a stainless pot covered with a towel for a week, stirring daily. Then in to the carboy with an airlock until it stops bubbling. I’ve never made mead before but do raise a few bees. Honey is like gold so I don’t want to waste it by ruining a batch of mead. I grow my own elderberries and have a big bag in the freezer. I have been kicking around the idea of making some mead with elderberries and then I found your article. Hey there, Ned! Thanks for commenting! I have used bread yeast, sometimes I use wild yeast, and other times I’ll spring for the fancy stuff when I can. 🙂 I have made muscadine wine with Welch’s frozen grape juice concentrate, but the sweetness got all eaten up by the yeast. I added sugar syrup to every bottle I opened before drinking! Sometimes I use the open bucket method like you describe, too…but only when I’m wild-fermenting or using fresh fruit or big chunks of stuff that I plan to strain out before it goes in the carboy. I haven’t yet started raising bees, but I’m excited to! I’ve taken a lot of courses with the local beekeepers association. It is on the top of my list of things to do. A little off topic but since you mentioned wanting to start raising bees, this is one of the most helpful sites I have found. http://www.bushfarms.com/bees.htm I also bought his book because sometimes I just want a reference when I’m not online. Just a cautionary note; I’ve made elderberry wine with spices and it turned out more like a very strong liqueur. A little cinnamon goes a LONG way. Maybe a half cinnamon stick (2 inches) when you boil the ginger and then remove it. Just a thought. Have you tried stopping the fermentation early? the airlock should bubble quickly for the first week (give or take), then start to slow down, if you stop fermentation at this point and siphon it into a new container to settle it will keep some of the original sweetness and honey flavour. I have read about and tasted meads that have been stopped as you describe, but I haven’t used that method myself. I have a sulfite sensitivity that can trigger migraines, so I avoid those. Do you know of a fermentation stopper that isn’t a sulfite? I’d be willing to try! Amber, love your site and your recipes. I have brewed your dandelion mead and it turned it out great! I currently have an elderberry wine and an elderberry mead going as well. Its interesting that the mead is much more alcoholic than the wine. Though the wine’s taste is right there and i love it as is. When you are nearing the end of the ferment do you use Potassium Sorbate or Potassium Metabisulfate before you bottle? If so do you have specific quantities for 1 gallon batches? I’m so sorry for the delay in response, Brian! I’ve been underwater trying to finish up my first book and I missed your comment entirely! I don’t use potassium sorbate or metabisulfate, as I prefer to avoid preservatives. I’m sensitive to sulfate/sulfites and so I just let the fermentation finish completely on its own. If you’re worried about “bottle bombs” then you can bottle it dry and sweeten a bottle after you open it to enjoy! I hope that helps, and Cheers! !